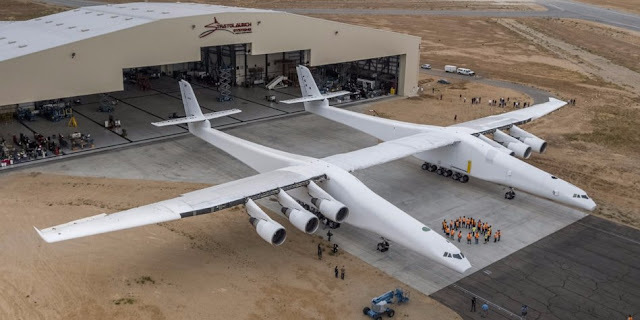 The biggest aircraft ever built made its public debut this week as Paul Allen’s aerospace company rolled the twin-fuselage monster out of its desert hangar for the first time. With wings spanning 385 ft, it is the world's largest airplane by wingspan - besting the AN-225's 290 ft. wingspan. The aircraft is also 238 ft. long and 50 ft. tall. It is designed to carry a rocket and payload with a combined weight of up to 250,000 kg and when in development was expected to cost $300m – although whether it came in on the budget has not been revealed. Like the AN-225, the Statolaunch plane is also powered by six high-bypass ratio turbofan engines. Stratolaunch - owned by Microsoft co-founder Paul Allen - intends to use the aircraft to move forward with its vision to " provide convenient, reliable, and routine access to low Earth orbit."